The plaque commemorates those of the 13th Infantry Battalion who died in service or were killed in action in the Gallipoli campaign in 1915 during World War One. The Battalion Flag also hangs in this Cathedral. 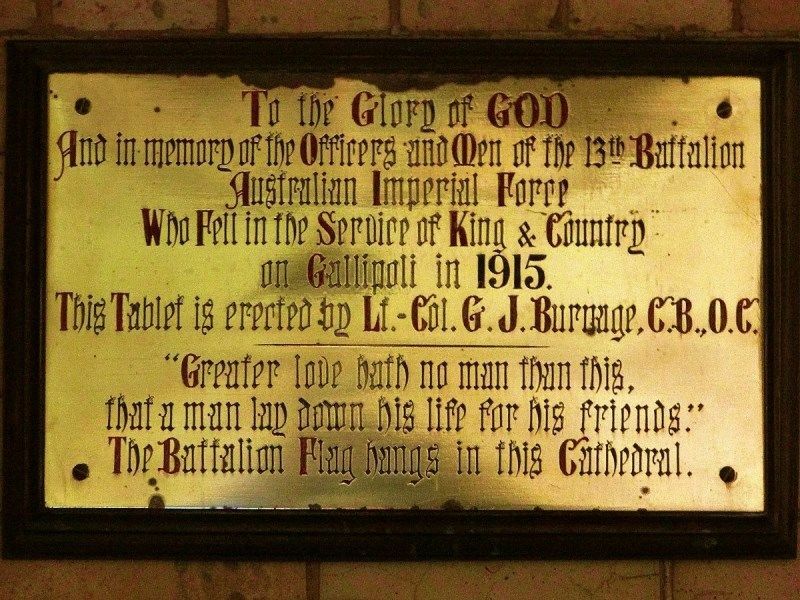 The ceremony of the unvelling and dedicating of a brass memorial to the memory of the officers and men of the 13th Battalion who fell on Gallipoli was performed at evensong at Newcastle Cathedral last night. The flag of the battalion already hangs in the Cathedral at the wish of the officers of the battalion before they went into action. The brass is the gift of Lieutenant-Colonel G. J. Burnage C.B., O.C., who also, at the Dean's request, performed the ceremony of unveiling the tablet. And in memory of the Officers and Men of the 13th Battalion Australian Imperial Force who fell in the service of King & Country on Gallipoli in 1915. This tablet is erected by Lt.-Col. G.J. Burnage, C.B., O.C. The Battalion Flag hangs in the Cathedral.